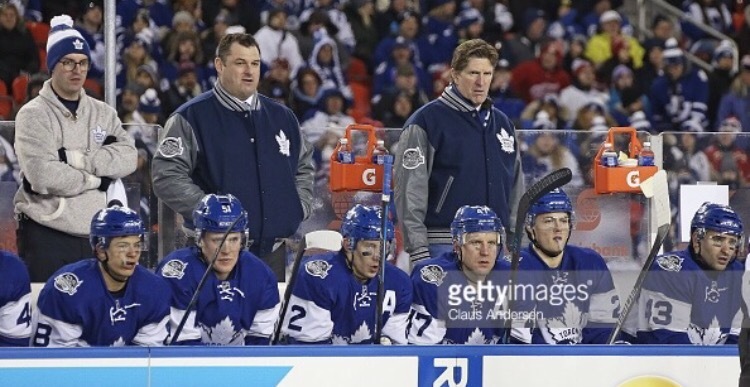 Could Vegas look to the Toronto Maple Leafs for their first head coach? Over the past few weeks, NHL coaches have been in the headlines more than usual. In that short time frame, we’ve seen five head coaches relieved of their duties – two of which would have been counted among the best in the league when this season began. With the firing of Jack Capuano, Gerrard Gallant, Ken Hitchcock, Claude Julien and now Michel Therrian, some big names have become available to NHL teams that may not be fully content with their head coaches – as we evident when the Canadiens dumped Therrian to jump aboard the Julien train. It’s always been said that “there are only 30 head coaching jobs and hundreds of people looking to fill them” – well starting next season there will be 31. They aren’t even technically an NHL team yet – that will come next month when they make their final expansion fee payment to the board of governors – but the brain trust of the Vegas Golden Knights has been at work for months trying to prepare for next season. The team has a general manager and a hockey ops department – the next step is hiring a head coach. Each time another NHL head coach has been fired, the Golden Knights have been brought up as a potential landing spot. Hockey Night in Canada has connected Gerard Gallant to the job more than once and Ken Hitchcock’s name keeps coming up as a man who could be the face of a new team. Claude Julien would have been the optimal hire since he’s a great coach and would have had a chance to have a Barry Trotz-like run with the expansion team. What if George McPhee doesn’t want a re-tread? What if he wants to think outside of the box and follow the pattern he established in Washington? As the long-time General Manager of the Capitals, McPhee hired his share of head coaches. Starting with Ron Wilson in 1997, McPhee hired six different head coaches for the Capitals – and each one of the five that came after Wilson had absolutely no NHL head coaching experience. Bruce Cassidy, Glen Hanlon, Bruce Boudreau, Dale Hunter, Adam Oats – each zero games as a head coach in the NHL, but that didn’t stop George McPhee from turning over the reins of his team to them. There’s another pattern that exists when it comes to George McPhee’s head coaching hires – they are all former NHL players. Now I’m not saying McPhee will hire an inexperienced former player – especially with the big names that are available – but the trend is there. We keep hearing about all the big names with NHL experience being linked to Vegas – but we shouldn’t rule out a fresh face getting the job. Enter D.J. Smith and Sheldon Keefe, both of whom are employed by the Toronto Maple Leafs. Keefe has long been viewed as a future head coach in the NHL and when he was hired to helm the Marlies, many believed it would be in Toronto. That all changed when the Maple Leafs were able to lure Mike Babcock to the bright lights of the centre of the hockey universe. Now Keefe is in his second season as an AHL head coach and if he wants to make the move to the next level anytime soon, it’s going to have to be outside of the Maple Leafs organization. If George McPhee is looking for a young coach to build a system and grow with a team through its infancy in Vegas, he could do a lot worse than Keefe. While he has very minimal experience as a head coach, Keefe’s name has consistently been brought up when discussing the brightest young coaching prospects in hockey. He did very well with the Soo Greyhounds and his rookie season in the AHL was as much of a success as you can have without winning the Calder Cup. Keefe has zero NHL coaching experience, but that isn’t something that has scared off McPhee in the past, but if the Vegas GM wants someone with a little NHL experience this time around, there could be another Maple Leafs employee of interest – assistant coach D. J. Smith. While Smith might not be a flashy hire for an expansion team that is trying to build a fan base, there is a very good reason to hire him. How do you win without an abundance of talent? You run a tight defensive system that takes the fun out of the game. D.J. Smith is an expert at that. During his brief time in the OHL, Smith was a part of two different Memorial Cup winning teams – once as an assistant in Windsor and again as a head coach in Oshawa. The Smith-led Oshawa Generals had a very distinct calling card, they sucked all excitement out of the game by wearing you down with their defense-first system. The Generals improved each year under Smith and concluded his run with a Memorial Cup win in 2015. While his entire three years in Oshawa was impressive, the highlight of Smith’s OHL career was the way his team shut down Connor McDavid in the OHL Championship series – as much as Connor McDavid can be ‘shut down’. During the 2015 OHL playoffs, McDavid was on a record pace – right up until he ran into Oshawa. He was still a point per game player, but his production was cut in half by Cole Cassels, Tobias Lindberg and the D.J. Smith defensive system. That season was enough to get the attention of the Maple Leafs, as Smith was hired as one of Babcock’s assistants that summer. With Toronto, Smith has spent two years learning from one of the best in the game while playing an integral part with the team. Smith’s calling card is the penalty kill – a byproduct of his staunch attention to a defensive system. Babcock has given him full control over the Leafs’ PK, and Smith has produced above average returns while working with below average talent last season – and kids this season. If McPhee decides he wants a young coach that can grow with a young team, he could do a lot worse than the two Leafs employees. Do I think Keefe or Smith will end up as the first head coach of the Vegas Golden Knights? Not really. People who know a lot better than you or I mention the team’s interest in veteran coaches for a reason. I do however think that if he is exploring all options, George McPhee has certainly considered them – even if only for a moment. Everyone seems to be focused on big names with a ton of experience when talking about the job but McPhee proved he isn’t afraid to rely on NHL rookies when he named Kelly McCrimmon as his lead assistant on the player personnel side. It’s not out of the realm of possibilities that he surprises everyone and goes the same route when naming his first head coach. It would definitely fit with the way he’s handled the task in the past.